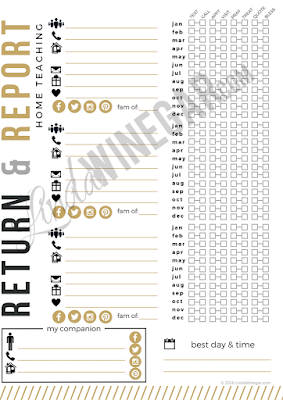 LDS General Conference Week - Day 1: Return & Report Tracking Sheets for Visiting Teachers & Home Teachers. Life gets so busy sometimes, I couldn't remember things I'd done or not done for the sisters I Visit Teach, although I knew they knew I loved them, I didn't remember if I had said something to them, if I shared a quote or set up an appointment or even if I had brought them a treat. I'm a space case! I just needed something where I could track everything all at once and see it on one sheet. So yes! 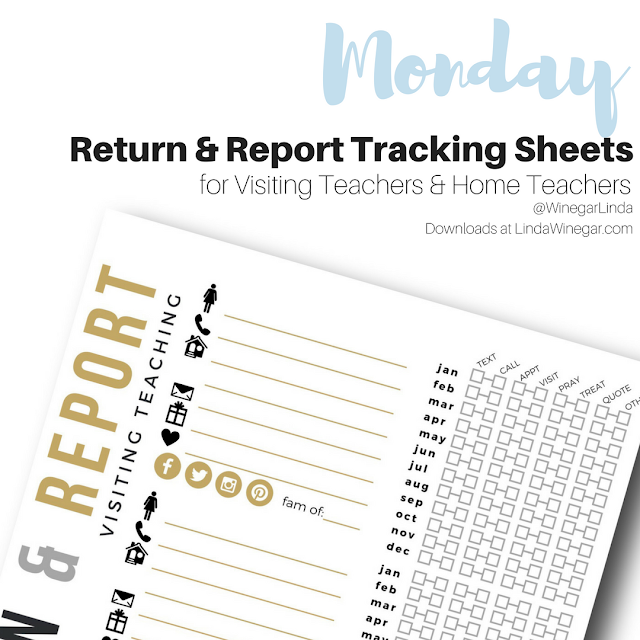 I had to create yet another list to help keep tabs on my own Visiting Teaching & the hubby's Home Teaching too. I love it and am already using it! Just went to visit my sisters this past Sunday and it was glorious being able to check mark some boxes. Yippy! Don't get me wrong though. I don't do it because they are on my "list" or are a "project" to me, they are sisters I didn't know I needed who the Lord knows I can bless but who can also bless me and I love each of them. I needed this written list to remind me how to be a better friend. I wish I had this list for each one of my other friends because it has the potential to make my sisters feel the Savior's love more than just once a month. I now can remember that I am actually doing all that I can for my sisters because I usually just contact them at the end of each month. I'm the biggest procrastinator! Sure some may think the list is a little INTENSE with the check boxes, (hey, don't download it if it's too much to handle or overwhelming) but I just couldn't bring myself to take any away after I had thought of them, so they are there for a wise purpose. You're lucky there aren't more boxes! It helps remind me to serve, to remember them, to pray for them, to love them and helps me magnify my calling as their sister in Christ and even helps me remember that I did do something when I've thought I've forgotten them. I don't want to feel like I could have done more in the vineyard, I want to feel like I did my good, my better, my best! I hope it brings peace to your life remembering how you've served your sisters, so when you are asked to Return & Report, you'll remember what a blessing you are to them and again feel of the Savior's love for you because you truly are an angel to your sisters and "a good and faithful servant." Click on the images below to be taken to the PDF files on my Google drive.